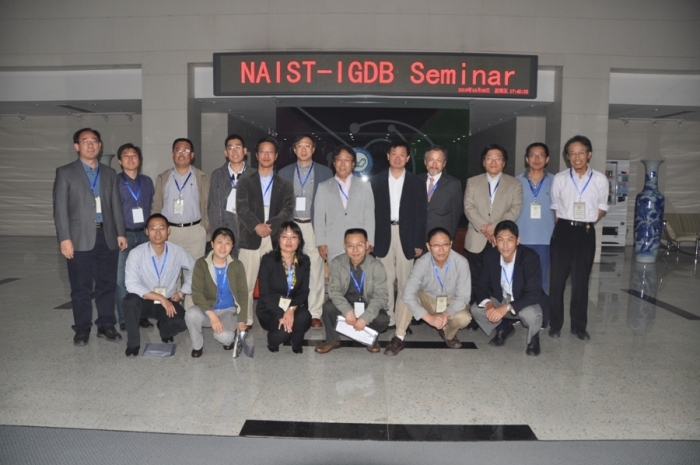 To strengthen bilateral cooperation and academic exchanges, a joint workshop between Nara Institute of Science and Technology (NAIST) and Institute of Genetics and developmental Biology, Chinese Academy of Sciences (IGDB, CAS) was held in Beijing on October 8, 2010. The NAIST-IGDB joint workshop was chaired by Dr. Mingsheng Chen and Dr. Yonghong Wang. Scientists from NAIST and IGDB reported their research progresses and discussed potential collabortationsin plant functional genomics, metabolism, signal transduction, protein degradation, and morphogenesis. Dr. Taku Demura, Dr. Ko Shimamoto, Dr. Seiji Takayama, Dr. Akiho Yokota, Dr. Masaaki Umeda, Dr. Takashi Hashimoto, and Dr. Masao Tasaka from NAIST and Dr. Xiaofeng Cao, Dr. Xiangdong Fu, Dr. Chuanyou Li, Dr. Yunhai Li, Dr. Qianhua Shen, Dr. Guodong Wang, Dr. Qi Xie, Dr. Jinsong Zhang, Dr. Yihua Zhou and Dr. Jianru Zuo from IGDB attended joint workshop. To get to know each other, Dr. Weicai Yang and Dr. Ko Shimamoto provided an overview of IGDB and NAIST respectively, during the meeting. Dr. Jiayang Li, Vice president of CAS, met with the participants and attended the closing ceremony. The one-day joint workshophas strengthened the academic exchanges and has provided a communication platform for the collaboration between NAIST and IGDB.